Fritz Lang's The Woman in the Window has the distinction of being one of the films that inspired the critics of the French New Wave to coin the term "film noir." Lang had always made expressive use of light and shadow in his films, dating back to the German Expressionist influences seen in films like Metropolis, Die Nibelungen, and M. Yet here, the shadowy domestic drama (the stark contrast beautifully preserved on the new Kino Blu-Ray), the femme fatale, the murderous intrigue (and the fedoras), all make their appearance in what would become the hallmarks of the American noir as we know it today. Of course, film noir's roots are in the German Expressionist tradition championed by filmmakers like Lang, who eventually emigrated to America, bringing the style with them. 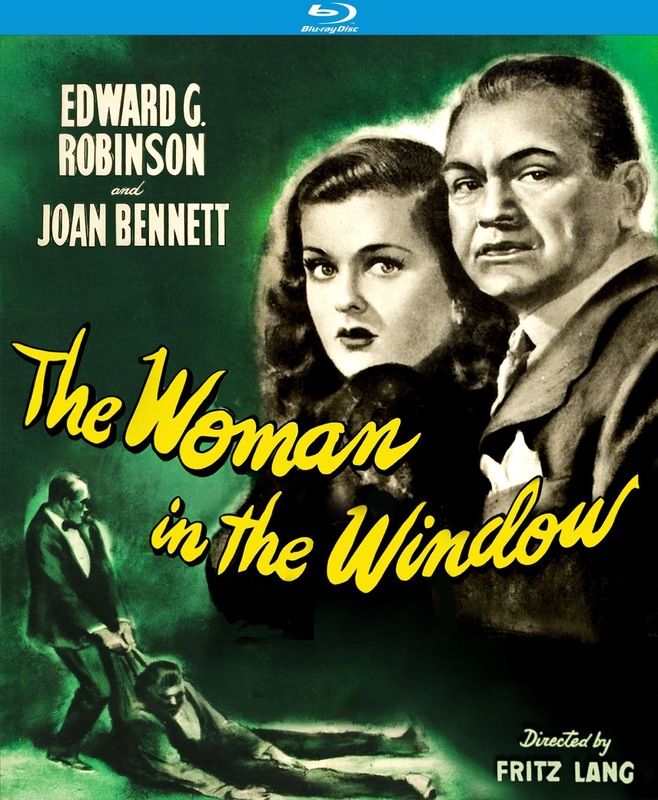 Released in 1944, The Woman in the Window is one of the earliest examples of this phenomenon, and while Lang certainly made stronger films during this period (1945's Scarlet Street, also starring Edward G. Robinson, arguably being his finest American picture), it's hard to deny the historical importance of The Woman in the Window. Robinson is wonderfully cast against type as Richard Wanley, a mild-manner professor who takes a shine to a lovely woman in a painting on the street near his usual evening haunt. 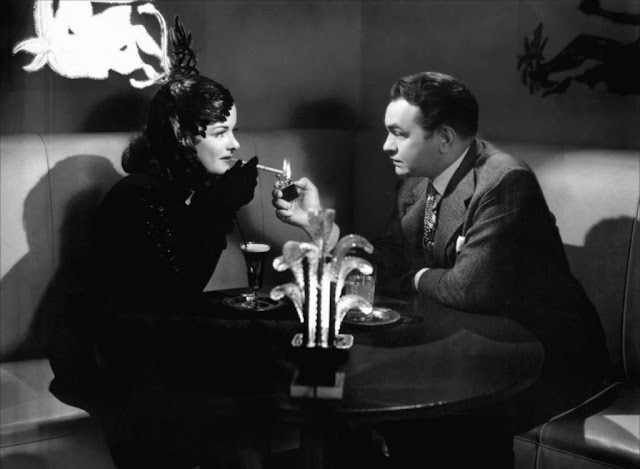 One night, while admiring the painting after a nightcap with his friends, he meets the painting's subject, the beautiful and mysterious Alice Reed (Joan Bennett), and returns with her to her home. It isn't long, of course, before they are interrupted by a jealous lover, and Wanley, a criminal justice professor, kills the man in self-defense. Rather than call the police and risk his marriage, Wanley decided to dispose of the body himself (after all, who would ever know he was in any way connected to either of these people). Naturally, things do not go according to plan. And it isn't long before Wanley's good friend, the District Attorney, is assigned to track down the killer, putting the professor uncomfortably close to the case. Lang directs with an almost Hitchcockian sense of suspense, laying in a wry sense of humor as Wanley is forced to take part in his own investigation. But as the circle closes in, Lang expertly ratchets up the tension, especially in the thrilling cover-up sequence, which displays particularly Hitchcockian influences as it chronicles Wanley's missteps, both known and unbeknownst to our protagonist. It also borrows, somewhat coincidentally, from Josef von Sternberg's 1930 masterwork, The Blue Angel (also available from Kino Lorber). Von Sternberg was a contemporary of Lang's who was known for his collaborations with Marlene Dietrich, and Blue Angel, which he made in both German and English language versions at the same time, told the story of a straight-laced professor whose infatuation with a lounge singer becomes his undoing. The Woman in the Window follows a similar idea to a different conclusion, and features a last-minute dramatic twist that undermines much of the dramatic tension that it has so painstakingly built (one can't help but wonder if the decidedly bleak first ending ran afoul of the Production Code). Yet even with its cop-out ending, The Woman in the Window remains a potent piece of work. It showcases Lang potently adapting his style for American audiences, and in the process helping to develop one of America's most indelible contributions to cinema history. But like many American achievements, it was based on foreign styles, built by immigrants, adapted from something which had come before - a fitting metaphor, perhaps, for American history in general. THE WOMAN IN THE WINDOW | Directed by Fritz Lang | Stars Edward G. Robinson, Joan Bennett, Raymond Massey, Edmund Breon, Dan Duryea, Thomas E. Jackson | Available on Blu-Ray and DVD from Kino Studio Classics on June 19.